Kayaks is one of those paintings that has stewed in my brain for some time. I take a lot of photographs but certain ones continue to come back to me as something I need to paint, not want to paint but NEED to paint. The problem is I don't always know right away to go about it or what exactly it is that excites me about a scene. Initially, it was just the color of the kayaks that drew me to photograph it, because color is very seductive. Now, I think it was more than that. 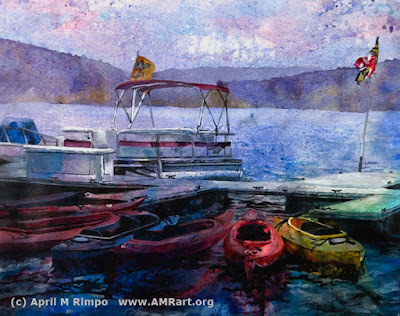 I'm also drawn to the contrast of the curves of the boats - both the kayak shape and the way they were arrayed by the dock almost like they were huddled in conversation - compared to the linear form of the dock. I did some editing from the photo, removing some extraneous boats from the background, altering some colors to improve the color harmony, and intensifying the color of the water in the foreground. 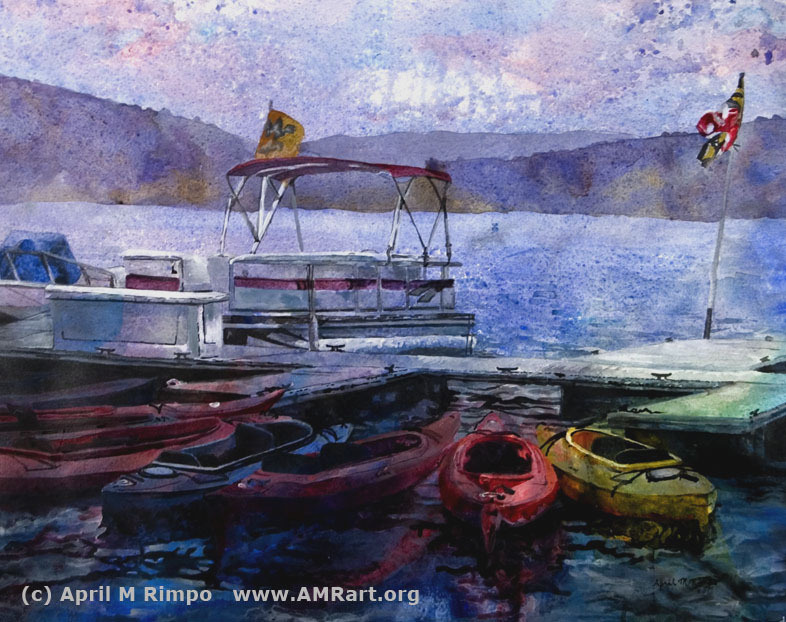 But the heart of the painting, the colors and shapes of the kayaks were retained from the original scene. I decided to start by creating a very loose wash of the foreground on Yupo, since the paints mix and blend in such wonderful ways on this plastic paper. Then I did a monoprint of that onto my hot press watercolor paper. This was a new process for me inspired by the Yupo to Yupo monoprints we created in Mark Mehaffey's workshop. I thought the hot press paper, which has a smooth finish, would pick up the paint more evenly than more textural cold press paper that I normally use. I had to spray water on the hot press surface after making the monoprint to allow me to make the paint spread more evenly across the foreground and to lighten some areas where the intensity was too extreme. Overall, this approach added some excitement to the underpainting. I also sprayed the top half of the paper so I could let some of the paint spread over the entire surface creating some water texture in the middle of the painting and some nice muted colors in the sky. Once dry, I transferred the drawing to the painting and continued to develop the rest of the painting with brushes. This was an exciting way of working since I had to pull out the shapes of the boats and dock from the underpainting. It was quite an interesting transformation requiring several layers of paint in some areas to get the final appearance I desired. 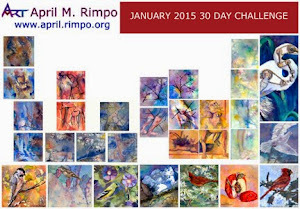 Interested in learning more about April's art inspirations, tips about her painting process, or art business tidbits? Want to know when her art is in exhibits? Consider signing up for her twice-monthly email. Love your painting and technique here, April. Another experimental success!! Happy holiday to you! Thank you, Sandy. Watching the wonderful results of all the experimental and mixed media artists during the January 30 in 30 challenge really got my creative juices flowing and is why I took the two workshops I did this year. I'm really enjoying adding some of these ideas into my work and finding new ways to accomplish more textural and intriguing paintings. I'm so glad you like it. I am so happy that you found the right approach and used the process you learned at Mark's workshop. This is a very successful solution to your problem. The yupo monoprint looks fantastic! The focus goes right to the red kayak. Kudos to you!